Italian, business savvy, passionate and funny, John Bell is refreshingly honest about his art, possessing an authentic perspective on life that demands your attention. 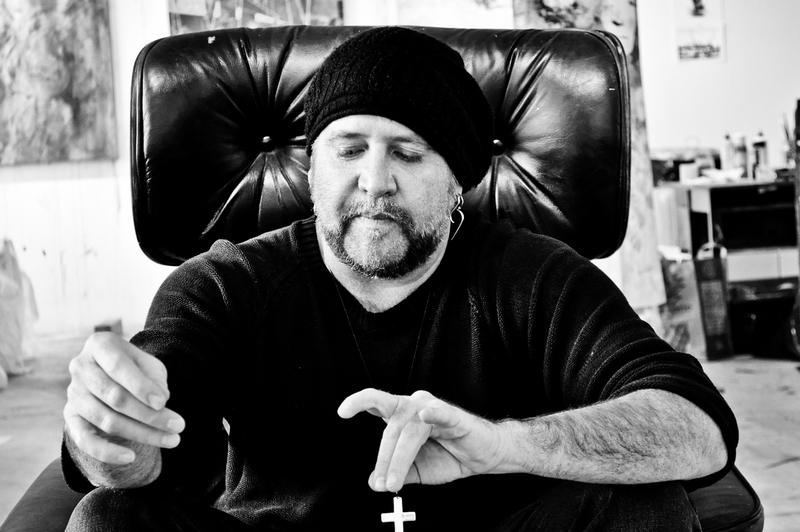 I sat down with Bell in his studio recently to learn about his upbringing and explore some ideas about what drives his creative process and how his art has evolved over the years. Bell’s current exhibit at Nox Contemporary, Postmodern Blues, is his first solo show since July 2010. It is his 44th show overall, an impressive number that includes both solo and group shows, the first of which was a solo show in 2004 at the now defunct Chroma Gallery. The exhibit features twenty provocative works that explore postmodern ideas of culture, its demise and rebirth. The desire to explore meaning in a postmodern age streams through much of Bell’s work. In 1435, Renaissance theorist Leon Battista Alberti set the course for how to best represent the human figure when he stated: “The movements of the soul are made known by the movements of the body.” This concept, where the inner life is revealed by the outer, had a tremendous influence on the painters of the time, and, though the statement has not remained part of today’s common artistic vernacular, the idea has resonated through the histories and is a reality in art today. The portraits of Utah painter Jeff Hale not only meet the age-old standard set by Alberti but also transcend it by capturing the distinctive character and individuality of each of his sitters. While every painting has the inimitable stylistic mark of this exceptional artist, each has a dimensional liveliness and distinguishing personality that is uniquely its own. There is a common misconception about the relation of craft to art, best exemplified by an appraisal that is heard only too often. Looking at a particular artisan’s work, someone will say it ‘transcends craft and rises to the level of art.’ This idea, that there is a continuum of how well hand work is executed, with ever-higher levels of craft eventually crossing a categorical boundary to become art, was not accurate to begin with. In the last century, moreover, artists have seemed determined to demolish it from both directions. Much recent art has deliberately employed mundane levels of skill, in order to prove that any human activity can qualify as art making. On the other hand, the universal deployment of machine manufacture has raised the cachet of hand-crafted examples, so that the finest levels of craftsmanship are routinely engaged in producing consumer goods that no one would mistake for art. It might be helpful to examine the dividing line, if that’s what it is, between craft and art, to see how they differ, but also just what each one takes from the other. An opportunity to do just that is available this month at Art Access. Ric Blackerby has filled the front gallery with a remarkable assortment of works in different media. All have in common (in both senses) the subject of insects, celebrating their variety and beauty. According to his statement, he began long ago by trying to capture their fascination in jewelry, a natural choice given the frequent use of ‘jewel-like’ as an expression of appreciation for a certain kind of dazzling, intricate, often metallic-looking variety of beetle. 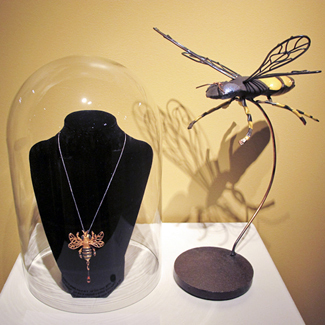 Yet here is a good example of how art is ‘other’ than craft, not ‘better.’ Jewelry that looks like an insect reminds us not just of the insect it seeks to resemble, but of the metaphorical connection between the two things: intricate construction, cerebral puzzles of tiny parts, optical dazzle of iridescent surfaces, and luminous colors. But there is something more. Just as ornaments remain somehow aloof, complementing our appearance without blending with it, so insects inhabit our world without becoming a comfortable part of it. Both are alien, answering to their own rules, and seeing them in art argues that they have more in common with each other than either has with us.